At last, here’s my Halloween nails contribution for CrashingRed. Even though I created a much more flamboyant Halloween nail art for SoNailicious, here I thought I’d share this quick Halloween nails how to that I did last year. Initially I just wanted to re-create one of an existing beautiful Halloween nail designs (check outthis Halloween Nail Art ideas compilation) but ended up with my own idea. 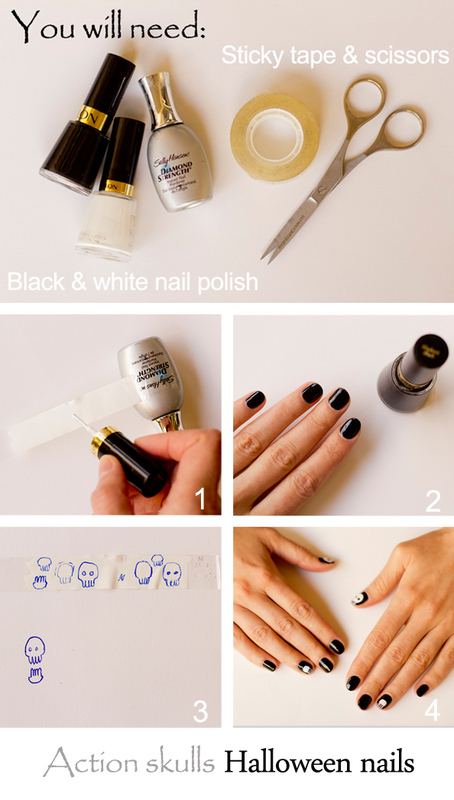 It doesn’t require any nail art skills just two polishes – black and white, sticky tape and a pair of scissors! 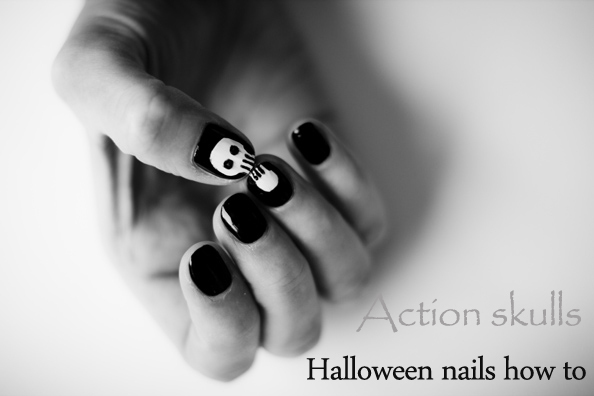 The result is these cute Halloween nails called “Action Skulls”. 2. Apply two coats of black nail polish to your nails. Make sure you leave enough time for this coat to set properly. I used Revlon Blackest Black. 3. Practice drawing the skulls on a piece of paper. Then draw them on the painted sticky tape. Cut them out. 4. Stick the skulls on your thumbs. Stick the chin on your ring fingers. if you couldn’t cut the sculls’ teeth properly (as I did) draw the teeth with the black pen. 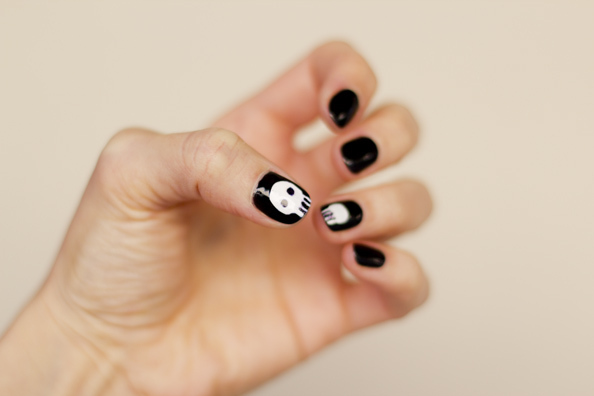 Apply a clear top coat and enjoy your cute skulls Halloween nails! What about you ladies, are you celebrating Halloween this year? 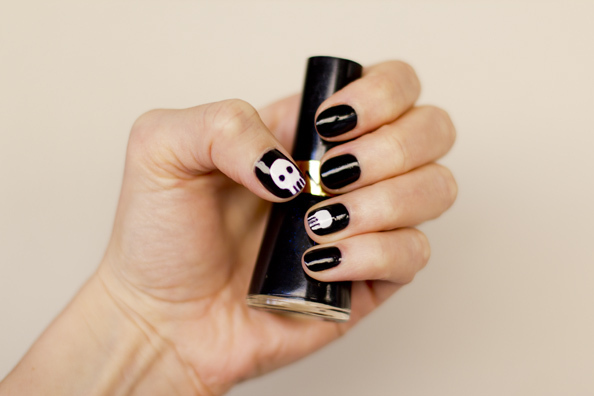 And… how do you like this “Action Skull” mani? Cute enough? How cute are these nails?! so fun for halloween… not too over the top or anything! Whoa those look so professional! And I like the technique you use because it seems pretty doable! I may have to try something like this! Did you stick them on and leave the tape on there or peel the tape off and the nail polish stayed? Did you draw on the tape on the side the polish was on or the other side? Did you put the polish on the sticky side or the non-sticky side? Love this Maria! The gif was a cute touch. Thank you all lovelies for your kind words! Spooky: ) Love the GIF!